The galaxy MACS0647-JD (inset) appears very young and is only a fraction of the size of our own Milky Way. The galaxy is about 13.3 billion light-years from Earth, the farthest galaxy yet known, and formed 420 million years after the Big Bang. Image taken by Hubble Space Telescope on Nov. 29, 2011, and released Nov. 15, 2012. A new celestial wonder has stolen the title of most distant object ever seen in the universe, astronomers report. The new record holder is the galaxy MACS0647-JD, which is about 13.3 billion light-years away. The universe itself is only 13.7 billion years old, so this galaxy's light has been traveling toward us for almost the whole history of space and time. Astronomers spotted the object using NASA's Hubble and Spitzer space telescopes, with the aid of a naturally occurring cosmic zoom lens as well. This lens is a huge cluster of galaxies whose collective gravity warps space-time, producing what's called a gravitational lens. As the distant galaxy's light traveled through this lens on its way to Earth, it was magnified. "This cluster does what no manmade telescope can do," Marc Postman of the Space Telescope Science Institute in Baltimore, Md., said in a statement unveiling the discovery today (Nov. 15). "Without the magnification, it would require a Herculean effort to observe this galaxy." Postman leads the Cluster Lensing And Supernova Survey with Hubble (CLASH), which performed the study. The mini galaxy is less than 600 light-years wide; for comparison, the Milky Way is 150,000 light-years across. Astronomers think MACS0647-JD may eventually combine with other small galaxies to create a larger whole. "This object may be one of many building blocks of a galaxy," said the Space Telescope Science Institute's Dan Coe, who led the study of this particular galaxy. "Over the next 13 billion years, it may have dozens, hundreds, or even thousands of merging events with other galaxies and galaxy fragments." Astronomers are continually spotting ever farther galaxies as their observation techniques and tools improve. 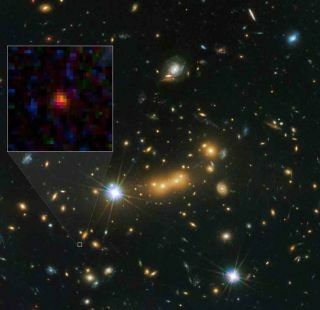 The last object to hold the title of farthest thing ever seen was the galaxy SXDF-NB1006-2, which lies 12.91 billion light-years from Earth. That object was sighted by the Subaru and Keck Telescopes in Hawaii. The CLASH survey, which discovered the new galaxy, MACS0647-JD, is working on a cosmic census of 25 large galaxy clusters using Hubble's Wide Field Camera 3 and Advanced Camera for Surveys. Those instruments first spotted MACS0647-JD, and then the Spitzer telescope, which observes in infrared light, confirmed the object was as far away as it appeared. The discovery will be detailed in a paper published in the Dec. 20 issue of The Astrophysical Journal.